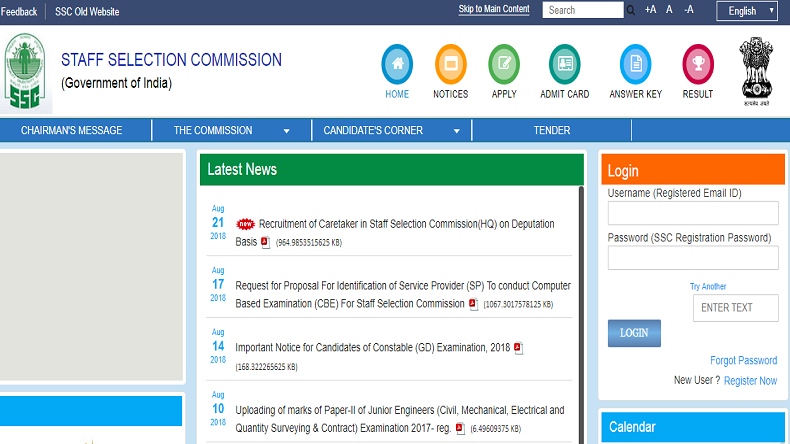 SSC Recruitment 2018: The Staff Selection Commission has released the notification for the recruitment of Caretakers on its official website. Candidates can now log in to ssc.nic.in and download the full notification before applying for the SSC Caretakers recruitment 2018. SSC Recruitment 2018 Notification: The Staff Selection Commission in India has released a notification for the recruitment of candidates to the post of Caretakers. The official notification is now available on the website of SSC and interested candidates can log in to ssc.nic.in and check the full notification before submitting their application forms for the post. According to the notification online, the Caretaker posts fall under the General Central service Group “C” Non-Gazetted and Non-Ministerial category and candidates will be recruited on deputation basis. Applications will be accepted only through proper channels along with full bio-data, photocopies of up to date documents mentioned in the notification and send their applications on the prescribed format on the address given below with sixty days of issuing the recruitment notification.